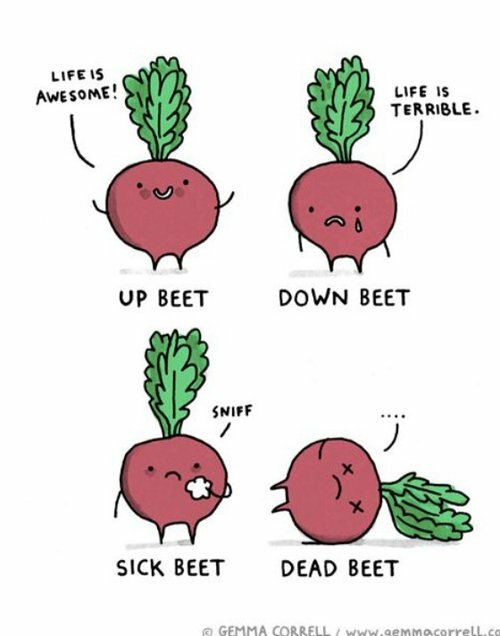 First, let’s pause for some more beet puns … because they are awesome. Beets don’t kale my vibe. I like to drop mad beets. We could go on but instead let’s talk about how fantastic our “Beet It” juice is. The combo of beets, carrots, apples, ginger and lemon will make your heart skip a beet … er, beat. We told you about all the benefits of the other four ingredients here so in this post we’re not going to beet beat around the bush. We’re talking about the goodness of beets! That stunning shade of purple showcases powerful phytonutrients that may help ward off cancer and their fiber content keeps you full to help manage your weight. Beets can help lower blood pressure with their natural nitrates which is converted to nitric oxide when consumed. Nitric oxide relaxes and dilates the blood vessels. Ancient Romans used beets as medicine … primarily as an aphrodisiac. Yep, beets are like nature’s viagra. Remember that relaxing and dilating of blood vessels? Beets can increase blood flow down there too. So beet everyone to the shop and snag yourself a bottle or three of this amazing elixir.